The way the following ABC article depicts this, it is a huge Donald Trump screw-up in which he demands Obama’s birth certificate only to fail to be able to produce his own until the media correctly pointed out his error. I actually think it was a stroke of genius: Donald Trump was confronted by a media which couldn’t wait to buy whatever Obama produced. They pointed out, “That’s not legitimate!” And then Donald Trump was able to produce his official certificate of birth. Now it’s your turn to do the same, Barry H. Do what Trump did: show us your actual long form birth certificate like the media demanded that Donald Trump do. And which Donald Trump DID. It’s no big deal at all – if you’ve actually got one. Donald Trump learned the hard way this week that if you’re going to call on the president to release his official birth certificate, you’d better do the same. On Tuesday, Trump, who is contemplating a presidential run in 2012, sought to correct the oversight, providing a copy of his official birth certificate issued by the New York City Department of Health to ABC News. 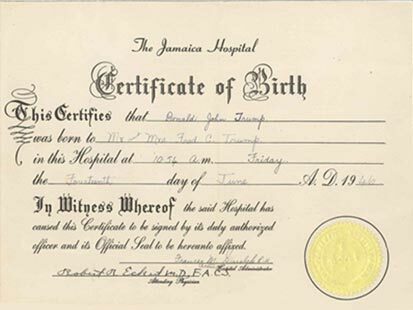 It shows that “Donald John Trump” was born June 14, 1946 in Jamaica Hospital in Queens.It lists his father as Fred C. Trump and his mother as Mary Mac Leod. The date of the report is listed as June 14, 1946. The image came with an accompanying memo from a member of Trump’s staff. Trump has been turning up the volume on his calls for Obama, who has been the target of allegations that he was not born in the United States by so-called “birthers,” to release his official birth certificate. The Obama campaign released a “certification of live birth,” which is a shorter document that carries the same legal weight as the long one, in 2008. In other words, the short form is NOT an actual birth certificate; it is rather just a piece of paper that says that somebody somewhere says that an actual birth certificate exists. That is a rather major difference when the existence of said actual birth certificate is in doubt. Q: How do you say “f**k you” in Bureaucratese? Hawaii Gov. Neil Abercrombie suggested in an interview published today that a long-form, hospital-generated birth certificate for Barack Obama may not exist within the vital records maintained by the Hawaii Department of Health. Abercrombie told the Honolulu Star Advertiser he was searching within the Hawaii Department of Health to find definitive vital records that would prove Obama was born in Hawaii, because the continuing eligibility controversy could hurt the president’s chances of re-election in 2012. Donalyn Dela Cruz, Abercrombie’s spokeswoman in Honolulu, ignored again today another in a series of repeated requests made by WND for an interview with the governor. Abercrombie did not report to the newspaper that he or the Hawaii Department of Health had found Obama’s long-form, hospital-generated birth certificate. The governor only suggested his investigations to date had identified an unspecified listing or notation of Obama’s birth that someone had made in the state archives. “It was actually written, I am told, this is what our investigation is showing, it actually exists in the archives, written down,” Abercrombie said. For seemingly the first time, Abercrombie frankly acknowledged that presidential politics motivated his search for Obama birth records, implying that failure to resolve the questions that remain unanswered about the president’s birth and early life may damage his chance for re-election. “If there is a political agenda (regarding Obama’s birth certificate), then there is nothing I can do about that, nor can the president,” he said. So far, the only birth document available on Obama is a Hawaii Certification of Live Birth that first appeared on the Internet during the 2008 presidential campaign. It was posted by two purportedly independent websites that have displayed a strong partisan bias for Obama – Snopes.com released the COLB in June 2008, and FactCheck.org published photographs of the document in August 2008. WND previously reported the Hawaii Department of Health has refused to authenticate the COLB posted on the Internet by Snopes.com and FactCheck.org. WND has reported that in 1961, Obama’s grandparents, Stanley and Madelyn Dunham, could have made an in-person report of a Hawaii birth even if the infant Barack Obama Jr. had been foreign-born. Similarly, the newspaper announcements of Obama’s birth do not prove he was born in Hawaii, since they could have been triggered by the grandparents registering the birth as Hawaiian, even if the baby was born elsewhere. Moreover, WND has documented that the address reported in the newspaper birth announcements was the home of the grandparents. WND also has reported that Barack Obama Sr. maintained his own separate apartment in Honolulu, even after he was supposedly married to Ann Dunham, Barack Obama’s mother, and that Dunham left Hawaii within three weeks of the baby’s birth to attend the University of Washington in Seattle. Conceivably, the yet undisclosed birth record in the state archives that Abercrombie has discovered may have come from the grandparents registering Obama’s birth, an event that would have triggered both the newspaper birth announcements and availability of a Certification of Live Birth, even if no long-form birth certificate existed. WND has also reported that Tim Adams, a former senior elections clerk for the city and county of Honolulu in 2008, has maintained that there is no long-form, hospital-generated birth certificate on file with the Hawaii Department of Health and that neither Honolulu hospital – Queens Medical Center or Kapiolani Medical Center – has any record that Obama was born there. Abercrombie is a liberal Democrat. He has every interest – and he admits he has that interest – in finding that record if it exists. The problem is that it doesn’t seem to exist. And Abercrombie officially gave up on his windmill-tilting knight’s errand. Here’s documented proof from Puerto Rico that birth certificates are relatively easy to falsify. The difference amounts to the fact that at least these Puerto Ricans like Sonia Aguilera actually HAD birth certificates, bogus as many of them were. Obama’s got squat. We don’t have any actual record that Obama’s birth certificate existed in 1961. But there is reliable evidence that telephones existed back then. Quite often, the Nigerian Scam email will contain legitimate information concerning a real political dissident’s death or imprisonment. This may be enough verification for a skeptical recipient. The second part of the classic Nigerian Scam begins when a recipient agrees to send confidential financial information to the sender in order to receive the money. From this point on, the Nigerian Scam artist will either use this private information to clean out the victim’s entire bank account or send a fake cashier‘s check as a partial payment. NEW YORK – Two private investigators working independently are asking why President Obama is using a Social Security number set aside for applicants in Connecticut while there is no record he ever had a mailing address in the state. In addition, the records indicate the number was issued between 1977 and 1979, yet Obama’s earliest employment reportedly was in 1975 at a Baskin-Robbins ice-cream shop in Oahu, Hawaii. The question is being raised amid speculation about the president’s history fueled by an extraordinary lack of public documentation. Along with his original birth certificate, Obama also has not released educational records, scholarly articles, passport documents, medical records, papers from his service in the Illinois state Senate, Illinois State Bar Association records, any baptism records and adoption papers. “I know Social Security numbers have been issued to people in states where they don’t live, but there’s usually a good reason the person applied for a Social Security number in a different state,” Siciliano told WND. Siciliano is a frequent expert guest on identify theft on cable television networks, including CNN, CNBC and the Fox News Channel. To verify the number was issued by the Social Security Administration for applicants in Connecticut, Daniels used a Social Security number verification database. She found that the numbers immediately before and immediately after Obama’s were issued to Connecticut applicants between the years 1977 and 1979. Nor is there any suggestion in Obama’s autobiography, “Dreams from My Father,” that he ever had a Connecticut address. The published record available about Obama indicates his first job as a teenager in Hawaii was at a Baskin-Robbins in the Makiki neighborhood on Oahu. USA Today reported the ice-cream shop still was in operation one year after Obama’s inauguration. Another anomaly in the law enforcement databases searched by Daniels and Sampson is that the date 1890 shows up in the field indicating the birth of the number holder, along with Obama’s birth date of 08/04/1961. A third date listed is 04/08/1961, which appears to be a transposition of Obama’s birth date in an international format, with the day before the month. Daniels said she can’t be sure if the 1890 figure has any significance. But she said it appears the number Obama is using was previously issued by the Social Security Administration. After an extensive check of the proprietary databases she uses as a licensed private investigator, Daniels determined that the first occurrence of Obama’s association with the number was in 1986 in Chicago. And all you need to pass of a massive hoax like this is two liberal states – and these are two of the most liberal states in the nation – and a press that flew thousands of miles to Anchorage to dig through Sarah Palin’s garbage but which utterly refused to go next door to look at Obama in Chicago. And that is precisely what we have. For the record, Democrats argued that John McCain did not qualify for the presidency of the United States because he had not been born in the United States. That was set to rest when John McCain produced his birth certificate. John McCain was born in a US military hospital (US territory) in the Panama Canal Zone area in 1936 to an American father (a US Navy officer) and to an American mother. I am doing nothing more than Democrats did in demanding Obama’s birth certificate. The differences are significant: we KNOW that Obama’s father was NOT a U.S. citizen, and we further KNOW that Obama has not produced a birth certificate. At this point, I do not believe that Obama is qualified to be president either in regard to his complete lack of experience, or in regard to his dangerous un-American socialist agenda, OR IN REGARD TO HIS BIRTH. I agree with the liberal Democrat Governor of Hawaii who had every interest and all the necessary power to find Obama’s actual birth certificate if it existed. Yet we DO have these “political implications.” Because Obama won’t – or more likely CAN’T – produce his birth certificate. At this time, I refuse to recognize the legitimacy of Barack Obama as the lawful president of the United States until he resolve these very legitimate questions. Somebody, somewhere, please get this Post Turtle out of the American people’s White House.